Philip Pendleton Barbour (May 25, 1783 – February 25, 1841) was the 10th Speaker of the United States House of Representatives and an Associate Justice of the Supreme Court of the United States. He is the only individual to serve in both positions. Born in Gordonsville, Virginia, Barbour established a legal career in Gordonsville after studying at the College of William & Mary. Several members of Barbour's family, including Governor James Barbour of Virginia, went on to hold prominent political office. Barbour won election to the House of Representatives in 1814 as a member of the Democratic-Republican Party. He served a single term as Speaker from 1821 to 1823 and declined to seek re-election to Congress in 1824. Barbour returned to Congress in 1827 as an ally of Andrew Jackson. Barbour served in Congress until 1830, when he accepted appointment as a judge of the United States District Court for the Eastern District of Virginia. President Jackson appointed Barbour to the Supreme Court in 1835 to fill a vacancy caused by the death of Gabriel Duvall. He served on the Court until his death in 1841. On the Court, Barbour generally supported Jacksonian principles and states' rights. Barbour was born near Gordonsville, Orange County, Virginia, as the son of a planter, Thomas Barbour, who was a legislator, neighbor and early political sponsor of James Madison. He was named for his ancestor Philip Pendleton, through whom he was related to politician and judge, Edmund Pendleton. The family was one of the First Families of Virginia, descended from a Scottish merchant who married a Miss Taliaferro and made his home in nearby Culpeper County, Virginia. Like his brother James Barbour, Philip attended common and private schools before beginning formal legal studies under Virginia jurist, St. George Tucker in Williamsburg, Virginia. Financial circumstances caused him to leave Philip in 1799. He soon moved to Kentucky to make his fortune, where after a year reading law, he was admitted to the bar, and began practicing law in Bardstown. After another year, friends persuaded him to return to Virginia and resume his studies at William and Mary College, so in 1802, he began practicing law near his family home in Gordonsville. In 1804, Barbour married a local planter's daughter, Frances Johnson, with whom he had one son named Sextus Barbour. Barbour practiced law for eight years before he started his public life as a member of the Virginia House of Delegates from 1812 to 1814. When U.S. Representative John Dawson died, Barbour won the special election to fill the seat, and served as a Jeffersonian Old Republican in the U.S. House of Representatives from September 19, 1814 to March 4, 1825, reaching the office of Speaker from 1821 to 1823. Barbour entered politics as the nation witnessed a shift in sovereignty where former state's rights activists such as current President James Madison, and Virginia leaders, Henry Clay and his brother, Senator James Barbour, began supporting nationalistic policies. Throughout this shift in power, Barbour remained a strong advocate of Jeffersonian "Old Republican" principles of states rights and maintaining a strict construction of the Constitution. Barbour's reputation for constitutional conservatism grew with his opposition to the Bonus Bill of 1817. The Bill permitted the federal funding of internal improvement projects such as building roads like that being constructed to connect Buffalo, New York to New Orleans, Louisiana, through Washington. Barbour viewed federally funded internal projects as outside the sphere of Congress' powers and therefore unconstitutional and undermining state sovereignty. Barbour viewed states as sovereign, political communities, independent of an overarching political dynasty and free to secede from the Union if the federal government infringed on the rights of the states, an argument that he employed when countering restrictions to Missouri's admission to the Union as a slave state. His opposition to national restrictions on slave states served to foment his passion for states' rights but also develop his pro-slavery argument in politics. As a Congressman, Barbour was the first prominent politician to openly contest the constitutionality of protective tariffs, claiming the tariffs to be unjust and unconstitutional. In 1821, Congressman Barbour served as counsel for the state of Virginia to argue the issue of whether the Supreme Court had jurisdiction to rule in the case Cohens v. Virginia, in which two men from Baltimore were convicted for selling D.C. lottery tickets in Virginia. Barbour unsuccessfully argued that the Supreme Court had no jurisdiction over the case since the lottery law banning the sale of foreign lottery tickets was not meant to affect Virginia. Therefore, the law was a local rather than a national issue because the law did not need to affect all states. He also maintained that the Court had no jurisdiction because a state was a party in the case, and the Eleventh Amendment prohibited a suit against a state without its consent. However, Chief Justice Marshall held that the federal judiciary had jurisdiction over this case based on Article VI, the Supremacy Clause, therefore mitigating Barbour's desire for enhanced state superiority while reinforcing federal supremacy. This case served to strengthen Barbour's reputation as an Old Republican leader in a political system that was waning in Virginian influence as well as shifting power between parties with the election of Andrew Jackson as the seventh President of the United States. Andrew Jackson's election in 1828 led to the bifurcation of the Old Republican Party into the Jacksonian Democratic Republicans and the opposing National Republicans. Jackson formed the Democratic party on the foundation of Old Republican principles, such as Jefferson's displeasure with Hamilton's National Bank. During his two-terms, President Jackson destroyed the Second Bank of the United States, and advocated for individual liberty, states' rights, and was pro-slavery. Barbour declined to run for re-election in 1824 and turned down an offer from Thomas Jefferson to become the professor of law in the University of Virginia in 1825. Instead, he accepted the Virginia legislature's appointment as a judge of the general court of Virginia. He served for two years. In 1827, Barbour returned to his seat in the House of Representatives as a Jacksonian. For the first two years of his second stint in the House, he was chair of the U.S. House Committee on the Judiciary. In 1829, Barbour became one of the first Jeffersonian Old Republicans to join the Jacksonian Democrats in opposition of the National Bank. He fought to expose the Second Bank of the United States as a private enterprise, endowed with federal funds while only masquerading as a government institution. Although his anti-Bank campaign did not take hold, Barbour's advocacy for state sovereignty, the removal of the National Bank, and the legalization of slavery in territories such as Missouri earned him favor with President Andrew Jackson. 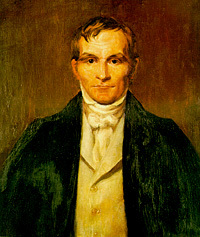 Also in 1829, while continuing to serve as a U.S. Representative, Barbour became a delegate for the Virginia Constitutional Convention of 1829-1830, and the Convention elected him their second president, after the Convention's first president, James Monroe, had to withdraw due to failing health on December 8. As such, Barbour (with distinguished Virginians such as Monroe, James Madison, and John Marshall) helped restrict discussion of slavery's role in the Commonwealth, and limited the rancorous assembly's debates to issues of representation and suffrage (Virginia had been one of the last states to allow only landowners to vote, and slaveholders had disproportionate power). The resulting constitution was adopted in 1830, despite the votes against it from the state's northern and western areas (much of which ultimately split off to become West Virginia during the American Civil War decades after Barbour's death). Barbour also turned down offers of a chancellorship and the post of U.S. Attorney General before finally resigning his congressional seat October 15, 1830 to accept President Jackson's appointment to become judge of the United States District Court for the Eastern District of Virginia. Jackson appointed Barbour by recess appointment on October 8, 1830, to a seat on that court vacated by George Hay. Barbour was formally nominated on December 14, 1830, and two days later he was confirmed by the Senate, and received his commission, serving thereafter until March 17, 1836. In 1832, Democrats unhappy with the selection of Martin Van Buren as their party's vice-presidential nominee held a convention in Virginia, at which they nominated Jackson for president and Barbour for vice president. Barbour eventually withdrew his candidacy and endorsed the Jackson-Van Buren ticket, but the alternative Democratic ticket still appeared on the ballot in several Southern states. Barbour also refused nominations for judge of the court of appeals, for Governor, and for United States Senator. Although it was unknown whether Barbour could gain favor with voters outside Virginia, Barbour's campaigning on the Democratic ticket illuminated the similarities in parties and gained favor for the Democratic party because if a man like Barbour, loyal to his party even when his fellow Virginians chose different principles, could switch to the Democratic party, then the Democrats must hold the same values. By joining the Jacksonian Democratic Party, Barbour entrenched Old Republican principles into changing a new political dynasty therefore continuing the legacy of Jefferson and further validating the strength of Democratic principles by giving the Democratic party a history that preceded its formation (i.e., a notion tantamount to Lincoln's argument that state secession should not occur due to the state of a perpetual Union that existed since the first draft of the Constitution before the term, Union, was first used to describe the North during the Civil War). Therefore, Barbour's resignation allowed the second party system to coalesce by unifying the Democratic Party on the ideologies of war on the American system through the national reform retrenchment and economy, and a restoration of republican constitutionalism. In 1835, Chief Justice Marshall's death and Justice Gabriel Duvall's resignation created two vacancies on the Supreme Court. Although rumored to fill Marshall's vacancy, President Jackson, at the end of his second Presidential term, nominated Judge Barbour to fill Duvall's vacancy. Nationalists feared Jackson's appointment of Barbour because Barbour was a Jacksonian whose anti-administration Congressional legacy and Democratic beliefs would aim to undermine the federal supremacy achieved during the tenor of the Court under Marshall's leadership. This fear made the finalization of the decision an arduous process with two attempts at delaying the Senate's decision. On March 15, 1836, the Senate approved the appointment of Barbour by a vote of 30:11. During his brief term on court, Barbour heard 155 cases, for which he authored one major opinion and two dissents. Although Justice Barbour only served on the Supreme Court for five years, he became an active agent in shaping the legacy of the Taney Court by using his passion for states' rights and strict reading of the Constitution to place limits on federal power. During Barbour's first term (1837), he heard three cases that mitigated Marshall's accomplishment of judicial nationalism, Briscoe v. Bank of the Commonwealth of Kentucky, Charles River Bridge v. Warren Bridge, and New York v. Miln. Justice Barbour authored the major opinion for the case of New York v. Miln. In 1824, the state of New York passed a law that required all ship masters to provide a report delineating personal information of passengers in order to prevent smuggling and immigration of the impoverished for whom the state could not provide. Ship master Miln refused to comply with the law and was therefore jailed and fined. The case arrived to the Supreme Court on the issue of whether the New York statute regarding immigrants violated the Commerce Clause in Article 1, section 8 of the Constitution. Barbour held that the New York statute did not violate the Commerce Clause, because the statute was an exercise of the state's policing power granted to the state to "regulate their internal police and to take care that no detriment comes to the commonwealth." People could not be considered commerce for people are not "being imported goods, cannot fall within a train of reasoning founded upon the construction of a power given to Congress to regulate commerce, and the prohibition of the States from imposing a duty on imported goods." Justice Barbour argued that the statue was valid as an act of police power to protect the health and welfare of the community. Because it is within the powers of the state to have jurisdiction over its people and things within its territorial boundaries, then "the authority of a state is complete, unqualified, and exclusive." Justice Barbour's holding in New York v. Miln was supported by Taney's opinion in Charles River Bridge that the people have rights and it is the duty of both the state and the nation to preserve those rights in order to ensure the happiness and welfare of every citizen. New York v. Miln allowed Barbour to begin to set a precedent for the understanding of state power as he developed a states' rights constitutional vision for the Supreme Court. This opinion served to establish a narrowed definition for federal commerce power while expanding state policing power. For both Briscoe v. Bank of the Commonwealth of Kentucky and Charles River Bridge v. Warren Bridge, Barbour voted with the majority, simultaneously gaining more power for states and weakening Marshall Court nationalism. While Barbour did not spend enough time on the court to amass a lengthy composition of judicial opinions, he authored two dissents for cases Kendall v. United States ex rel. Stokes (1838) and Holmes v. Jennison (1840). Justice Barbour's two dissents demonstrated his aim to diminish federal authority by supporting Jacksonian political aspirations and opposing restrictions to state sovereignty. The case, Kendall v. United States ex rel. Stokes dealt with judicial supervision of executive acts. In 1835, President Jackson appointed Amos Kendall the Postmaster General for the United States. The firm Stockton and Stokes had contract with the previous Postmaster General, a debt that the firm wanted Kendall to pay. However, the Postmaster General was burdened by a lot of debt and did not satisfy the firm's request because he did not want to cheat his legitimate creditors. The Court viewed Kendall v. United States ex rel. Stokes as a proceeding against an executive government official who acted within the sphere of powers afforded to the Executive Department of the federal government. The Court dealt with the issues of whether the Supreme Court had the jurisdiction to hear the case under Section 25 of the Judiciary Act of 1789 and whether the Supreme Court had the power to issue a writ of mandamus under Section 13 of the Judiciary Act of 1789 to the Postmaster General Amos Kendall, a member of the executive branch. Barbour opposed the majority in Kendall v. United States ex rel. Stokes, where the Court held that the Supreme Court could issue a writ of mandamus to "compel the Postmaster General to perform any ministerial duty devolved on him by law." This issue and holding is similar to that in Marbury v. Madison (1803), a case involving writs of mandamus to an executive officer and where the Supreme Court held that the Supremacy Clause in Article VI and the notion of popular sovereignty granted the Supreme Court jurisdiction in not only state court cases but the power of judicial review to make legitimate and final rulings on constitutional questions arising in cases. Justices Taney and Catron concurred with Barbour's opinion that it was never within the scope of judicial power to control executive actions. Although Barbour believed that "Congress has the constitutional power to give to the federal judiciary …authority to issue the writ of mandamus," Barbour did not believe that the "Circuit Court of this district had not power to issue writ in question, and consequently, was of opinion that the judgment demanding a peremptory mandamus should by reversed." Even though the Postmaster General was subject to direction and control of the President with respect of the duties imposed by law, when the law is 'ministerial,' Congress can limit and regulate the executive officials. Because Congress created the executive office, then Congress could monitor executive decisions, but the President is not controlled by the federal courts. While the opinion of the case served to further define separation of powers by holding acts of the executive branch as subject to the rulings of the Supreme Court, Barbour's dissenting opinion served to discourage judicial supervision of executive acts by extending the power of President Jackson's departmental theory, the notion that the executive branch has the right to interpret the Constitution for itself. Barbour's opinion in Kendall v. United States ex rel. Stokes demonstrated his loyalty to President Jackson's political aspirations and the power of Jackson's Administration. Justice Barbour made his most powerful argument in favor for states' rights in the Court case Holmes v. Jennison, a case focused on the extradition of a fugitive from Vermont to Canada. In 1838, George Holmes, a resident of Quebec, was convicted of murdering Louis Paschal Achille Tache in Canada. Holmes escaped to the United States where he was detained under issue of warrant in Vermont. Silas H. Jennison, the governor of Vermont, issued the warrant stating that Holmes, being a citizen of the lower province of Canada, would be arrested and returned to suffer persecution according to the Canadian justice system, even though the United States had no extradition treaty with Canada. Because the Vermont Supreme Court refused to issue a writ of habeas corpus, Holmes petitioned to the Supreme Court on grounds that he was unlawfully imprisoned and deprived of his personal liberties. The case became a contentious debate further polarizing nationalists from states' rights Justices. Holmes v. Jennison, was brought to Court on the issues of whether the U.S. Supreme Court had the authority to review the case based on Section 25 of the Judiciary Act of 1789 and whether the governor of Vermont's deliverance of a fugitive from Vermont to Canada violated the Extradition Clause of Article IV, section 2 of the Constitution, which gave power to the federal government to surrender a fugitive to a foreign government. Chief Justice Taney affirmed the Court's jurisdiction to review the case as well as the exclusive power of the federal government to govern foreign relations. Because of that exclusive power, the state governor violated Article IV, section 2 of the Constitution to surrender fugitives to a foreign country. Dividing 4 to 4 over the issue of jurisdiction, the U.S. Supreme court dismissed the case for want of jurisdiction, so the Vermont Supreme Court ordered Holmes release even though five of the eight Justices denied the issue of Jennison's authority, thus enunciating the principle that the Constitution gives state officers no power to take any independent actions concerned with foreign governments. Barbour was one of the four Justices who disagreed with the Chief Justice's ruling. Barbour believed that because "there is no treaty on the subject of surrendering fugitives," being forged between state and foreign country, then the returning of fugitives to Canada did not violate a power granted to the federal government by the Constitution, and therefore the "authority, exercised by the Governor of Vermont, is not repugnant to the power of making treaties in its dormant state because it not the mere existence of power but its exercise which is incompatible with the exercise of the same power by the states." Because the Governor was exercising within his own rights without infringing on the rights of others and that the Constitution did not explicitly define the affairs of states with foreign countries, then Governor Jennison was completely within his rights to order the extradition. Because of the U.S. Supreme Court's tie vote, Barbour's opinion held. Justice Barbour's opinion in Holmes v. Jennison served to enhance his opinion in New York v. Miln that the state has to duty to maintain the welfare of its people. The Governor acted within his powers to rid the state of a potentially dangerous and wanted man. Holmes v. Jennison demonstrates Barbour's strict reading of the Constitution, which allowed him to read a more pronounced states' rights view into the text when ruling, thus expanding the definition states' power by granting more power to state authorities and reading of states' rights into the Constitution. Barbour died of a coronary thrombosis on February 25, 1841, while asleep in his bed, and partway through the arguments of John Quincy Adams, who sought freedom of rebel slaves in the Amistad Case. Justice Story (although opposing slavery and personally more nationalist than Barbour) eulogized his late colleague as earning the respect of his colleagues by his commitment to personal values, persistence to fight for his beliefs, and legal acumen. An Episcopalian throughout his life, Philip Pendleton Barbour, was buried in the Congressional Cemetery, Washington, D.C.. Barbour's long time friend and fellow Virginian, Peter V. Daniel, succeeded him on the U.S. Supreme Court, and continued Barbour's legacy of maintaining Jacksonian principles, states' rights, and strict constructionist reading of the Constitution. Locations named after him include Barbour County, West Virginia, Philippi, West Virginia and its Philip Barbour High School. Barbour's tenure on the Court demonstrated his loyalty to President Jackson's national vision and increasing Democratic ideologies in court cases while maintaining Barbour's vision for a narrowed reading of state's rights into the constitution. Barbour's decisions in major Court cases created an enduring Jacksonian legacy on the Taney Court. Barbour's furtherance of Jacksonian principles of departmental theory in his dissent Kendall v. United States es rel. Stokes, his long history of states' rights advocacy in his major opinion of New York v. Miln, and textualist reading of the Constitution in order to better discern state versus congressional power in his dissent in Holmes v. Jennison, served to illuminate the idea of a stronger state's rights constitutionalism and proponent of slaveholder's rights. Barbour's opinions began to unravel the work of Marshall's Court, and set a precedent for future cases as the country became more polarized. Barbour's arguments for the authority of President to interpret the Constitution as the President desires in Kendall v. United States ex rel. Stokes, and the expansion of states' policing power and power afforded to governing officials and Barbour's argument for lack of judicial power on the basis of the Eleventh Amendment in Cohens v. Virginia, allowed Justice Taney to rule in favor of slaveholders that slaves were not citizens in Dred Scott v. Sanford (1857). Ironically, they were also used by President Abraham Lincoln to issue a suspension of habeas corpus in 1861, therefore fomenting political unrest, inciting Southern state secession and the Civil War. ^ "Our Campaigns – US President – Barbour Democratic Convention Race – Jun 12, 1832". ourcampaigns.com. Retrieved 8 November 2015. ^ The South and the Politics of Slavery, 1828–1856. Retrieved 8 November 2015. ^ "New York v. Miln, 36 U.S. 102, 142 (1837)". ^ "New York v. Miln, 36 U.S. 102, 136 (1837)". ^ "New York v. Miln, 36 U.S. 102, 139 (1837)". ^ "Kendall v. United States ex Rel. Stokes, 37 U.S. 524, 642 (1838)". ^ "Kendall v. United States ex Rel. Stokes, 37 U.S. 524, 643 (1838)". ^ "Holmes v. Jennison, 39 U.S. 540, 593 (1840)". ^ "Holmes v. Jennison, 39 U.S. 540, 593 (1840". ^ "Argument of John Quincy Adams, Before the Supreme Court of the United States : in the Case of the United States, Appellants, vs. Cinque, and Others, Africans, Captured in the schooner Amistad, by Lieut. Gedney; 1841". avalon.law.yale.edu. Retrieved 30 May 2018. Abraham, Henry J. Justices, Presidents, and Senators: A History of the US Supreme Court Appointments from Washington to Clinton. New York: Rowman & Littlefield Publishers Inc, 1999. Friedman, L and Israel, Fred L. The Justices of The United States Supreme Court 1789-1969: Their Lives and Major Opinions. New York and London: Chelsea House Publishers, 1969. Huebner, Timothy S. The Taney Court: Justices, Rulings, and Legacy. California: ABC-CLIO Inc., 2003. Schwartz, Bernard. A Book of Legal Lists: The Best and Worst in American Law. New York: Oxford University Press, 1997. Urofsky, Melvin I. The Supreme Court Justices: A Biographical Dictionary. New York and London: Garland Publishing Inc, 1994. United States Congress. "Philip Pendleton Barbour (id: B000131)". Biographical Directory of the United States Congress. Philip Pendelton Barbour at the Biographical Directory of Federal Judges, a public domain publication of the Federal Judicial Center.